We are an independent business centre operator providing interior designed office space for business. 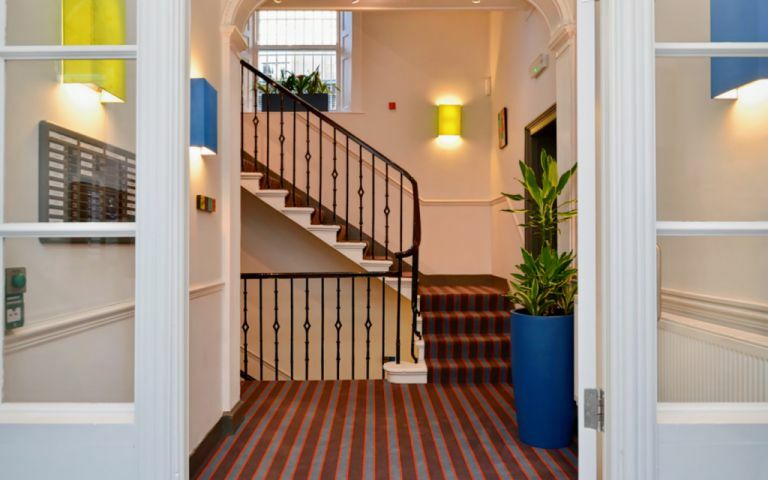 We are based in the heart of central Edinburgh, less than a minuteï¿½s walk from George Street. Originally built for Edinburgh's wealthy merchants over 200 years ago, our buildings have been converted for the digital age and are now home to some of Edinburgh's most exciting entrepreneurial enterprises. Within our historic buildings we have created digital age workspace. We understand the different ways in which our residents work and we do our best to meet their needs. We like to think of our space as uplifting, creative, artistic and colourful yet highly professional. The corporate business centre has its place, just not here. We provide a community to a wide variety of businesses including Web Design, Investment Management, Executive Search, SEO, Social Media, Digital Marketing, Film Production, PR and Communications, IFAï¿½s, Renewable Energy, Charities and Publishers among others. With a wide selection of offices ranging in size from a single person room to a 20 desk room, we can accommodate most small businesses. We have a boardroom with audio visual and conference facilities seating up to 12 people, two smaller meeting rooms seating up to 8 people, two business lounges with great connectivity for informal meetings and breaking out, fully fitted kitchens, bags of bandwidth, fully furnished offices with designer office furniture and great Italian filter coffee. We have pretty much thought of everything including the discount cards for local restaurants, bars, shops and the gym and spa, but if we've missed anything just let us know and we'll see what we can do about it. There's no small print, no hidden costs or nasty surprises which makes budgeting easy. Our Licence agreement is simple ï¿½ short term or long term residency - you choose. There are no lawyers' fees or cumbersome leases and no set up costs ï¿½ itï¿½s as simple as sign, sit down, plug in and play. Need to up-size or down-size? Let us see if we can accommodate you and if we can, we will. Need to move on? Just give us reasonable notice and you're on your way. We provide virtual office facilities to individuals, organisations and businesses looking for all the benefits of a city centre office address in Edinburgh but who donï¿½t necessarily need a physical presence in the city. We provide a registered office address, a mail handling and forwarding service, phone call handling, meeting rooms with tea, coffee, water and catering, fax, photocopying, scanning and printing facilities, use of our breakout spaces and business lounges, secretarial support and a desk as and when required. We're located in the heart of Edinburgh on Young Street, only a few metres from the city's best cafes, restaurants, hotels and shops on George Street. However you choose to travel to work - walk, run, bike, bus, train, car or tram, we are slap bang in the middle of it all.